development and team building skills. Steve clearly gives direction on what it takes to succeed. By shifting our mindset, recognizing success doesn't happen by accident, Steve enthusiastically demonstrates what's involved in this choice!... ...I believe Steve has given us a time tested recipe for success. He's been there, done that, is still doing it! Thanks for making it clear Steve. I choose success. Steve is as much the consummate professional off the field, as he was on the field. Steve did an outstanding job of preparation for his work with Brother International, by fully immersing himself with our company culture and our strategic goals. All of his hard work really came to life throughout his motivational, awe-inspiring and impactful speaking engagement. Best of all, Steve is a true gentleman, and made every interaction with executives and employees unique and memorable. Steve, WOW! Just finished your book, it came in mail @ 1PM. Reading your words, quotes from visionaries that impacted you and feeling that what you put together was intended to motivate ones inner voice, made quite an impact on me today. Enough to bring a deal I have been working on since last May a reality today! It will likely close on Monday. Thanks from my heart, you made a difference in my life! Steve Sax was a great addition to our annual Sales Training event. He connected with the audience with his motivational message and an empathetic understanding of their challenges in the marketplace. He was energetic and dynamic, and we received nothing but positive feedback from our employees. It was a pleasure getting to know him, as a speaker and as a person. Steve Sax is one of the hottest motivational speakers on the scene today. He delivers stunning speeches that link the audience with solid take aways, including leadership, personal development, and team building skills. Always by example. Drawing the distinction between talkers and doers. People will always follow the ultimate professional. Steve’s gripping personal testimony on leadership is one of the reasons he consistently receives standing ovations. There are many elements and styles of leadership-and Steve specifically targets this to his audience. Also, Steve draws from his extensive knowledge of American history, including the Civil War and early twentieth century. It all starts with a big dream. Never underestimate the will and passion of the human spirit. The value of motivation transcends all boundaries. Always known as a gutsy and passionate player on the field, Steve brings this same dynamic motivation to the stage. Also, he is able to draw from his success on the baseball field and in the world of finance to link this ultra important tangible to his audience. Grasping the importance of winning as a unit. Selflessness, Integrity, and Never compromising core principles. One of these core principles is humility. Being the leader that exemplifies charting a course with a humble heart is the ultimate in putting others first and why your team will follow you. Real life experiences dealing with overcoming a career on the verge of collapse. This is an example from Steve’s personal testimony as a professional athlete dealing with ridicule, self doubt, humility, and near collapse before a national viewing public. Sports are a mirror of life, and Steve directly links this enormous triumph to his audience and their personal everyday challenges. 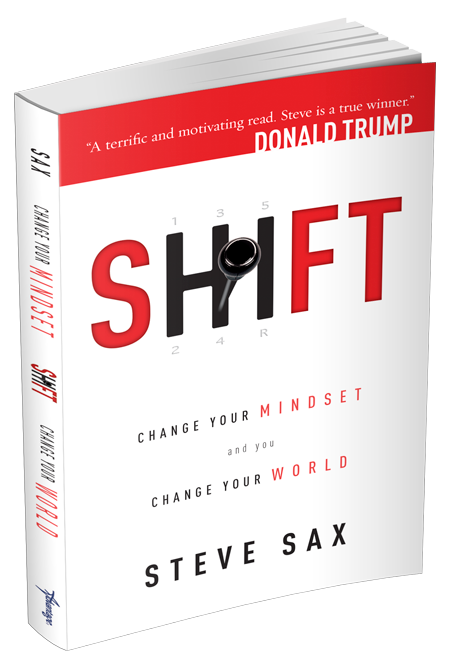 Shift, a motivational and inspirational book that outlines action steps to change your mindset and to become a success. Shift is endorsed by Donald Trump, president of The United States. There is no such thing as overnight success. Those millionaires in a minute stories are a blip on the radar. True sustainable success—at work or at home—is a habit, as natural and unstoppable as inertia. It all starts with that person staring back at you in the mirror! Everyone has the tools within to impart positive change. Ultimately, success is a choice, a deliberate and methodical choice made every single day. Watch videos of Steve, view photos, download one sheets and read Steve’s letter from the white house and more.